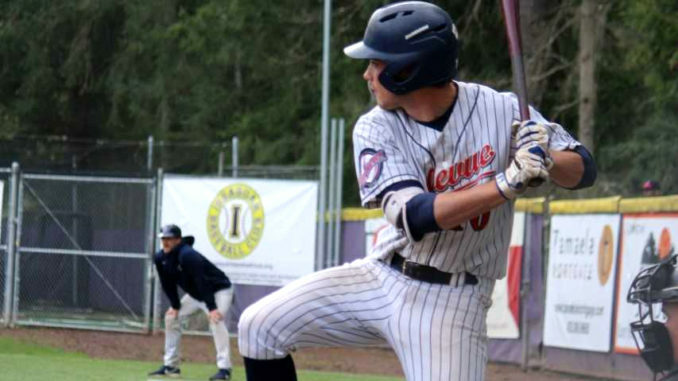 The Bellevue College baseball team is off to a solid start, with their 5-3 in-conference record placing them fourth in the North Region of the Northwest Athletic Conference. Their most recent round of success came in the form of a four-game sweep over division-rival Douglas. The first game was as fierce as could be, with Douglas dueling all the way to the 10th inning before Bellevue took the 12-11 victory. Designated hitter Kyle Seitz, first baseman Jake Terao and second baseman Lukas Motta all hit home runs. Seitz had a two-hit night with three runs batted in and two walks. The game ended on a single by left fielder Al Aurelio to score third baseman Carter Wallace from third. In the second game, Bellevue held the lead from the third inning onwards, with the final score being 7-5. In fact, Bellevue only earned four of their seven runs. Two errors in the first and fourth innings, as well as a balk in the third, allowed three runs to score based solely off missteps from the Douglas defense. Still, Aurelio went 2-5 from the leadoff spot with two RBIs, as well as scoring two runs. If the first two games were offensive showcases, the third game was not even close. Bellevue won the game 1-0, with their only run coming from a bases loaded walk by Douglas pitcher Finn Kaczmarowski. However, the real story is about Bellevue pitcher Brock Hathaway pitching a complete game shutout. He threw 119 pitches at a 73 percent strike-to-ball ratio, allowed just three hits while walking one over nine innings. Bellevue’s offense had trouble getting started, so they could not have asked for a better performance from Hathaway. The final game was more or less a return to form for the Bulldogs, as they took a convincing 10-2 victory to complete the sweep over Douglas. Five of their 10 runs came from errors by Douglas. Seitz had another memorable game, finishing 2-2 with two RBIs and two walks. Starting pitcher Nate Butcher allowed just one run on three hits over six innings, enabling the team to coast the rest of the way. He was awarded his first win of the season. The sweep over Douglas is the reason they’re in such a comfortable position, standings-wise. Olympic sits several games below them, and neither Edmonds nor Everett are unreachable. It should be noted that of Bellevue’s nine total losses, six of them are to Tacoma and Everett. Both of these teams are at the top of their respective regions, and neither managed to take all four games from Bellevue, which is a good sign. Coming up on Friday, Bellevue begins a four-game series against Edmonds at home, and we’ll see if Bellevue can snag second place in the region. According to a coaches poll from Apr. 10, this is a matchup between the third and eighth best teams in the NWAC.